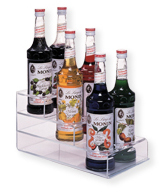 This syrup bottle display can display up to six of your customer's favorite syrups. It has three tiers so that each syrup bottle can be easily seen. This Syrup Bottle Display offers a advantageous way to show your merchandise. Made of clear Acrylic, this Countertop Food Service Dispenser is designed for functionality. Buy Syrup Bottle Display now - Use our convenient shopping cart or give us a call and place your order with a knowledgeable service representative today!